Each Astrix tablet contains 100mg of aspirin, which, when taken regularly, will help protect you against some of the problems of blood clotting. Medical supervision is necessary for the prolonged use of Astrix tablets. Contains gluten. Pharmacy medicine. Take 1 tablet per day with food or a large glass of water. 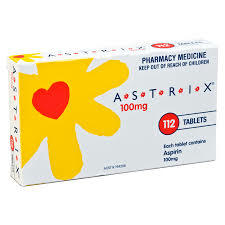 it is important to take an Astrix tablet every day, preferably at the same time each day. Start with the tablet marked with the corresponding day of the week. For use under medical supervision only.